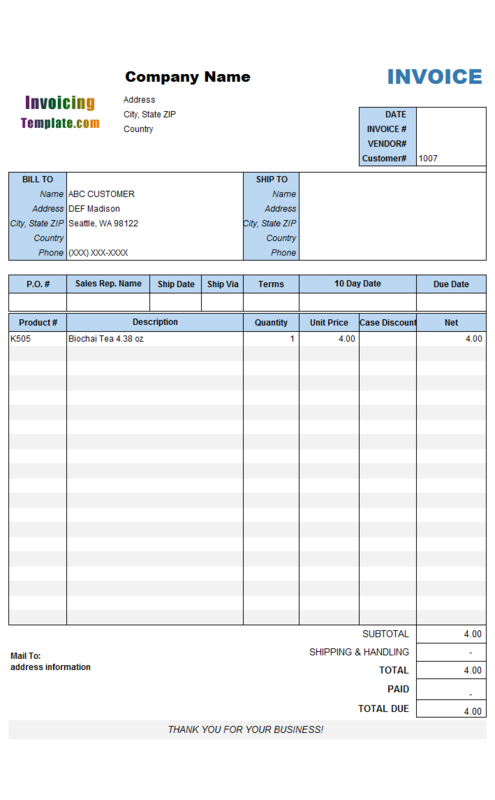 c7031 now includes the customized invoice template for the latest version of Invoice Manager for Excel. This is what you will see when you open gst-pst-invoice-template.xlsx. This template was originally published on office-kit.com as C7-006. 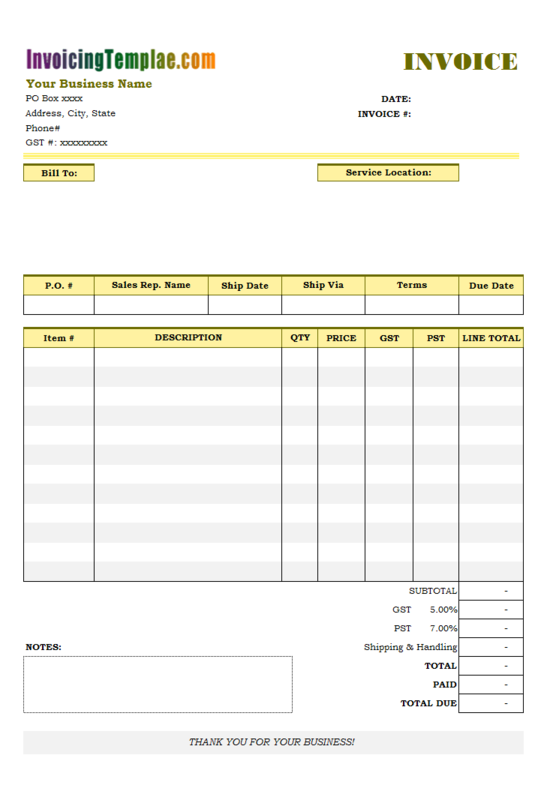 Here on InvoicingTemplate.com there are several customized version for this format: c7006 Handyman Invoice Template, c5055 Handyman Invoice Template (Sales Tax), and Handyman Bill Sample (No Tax). 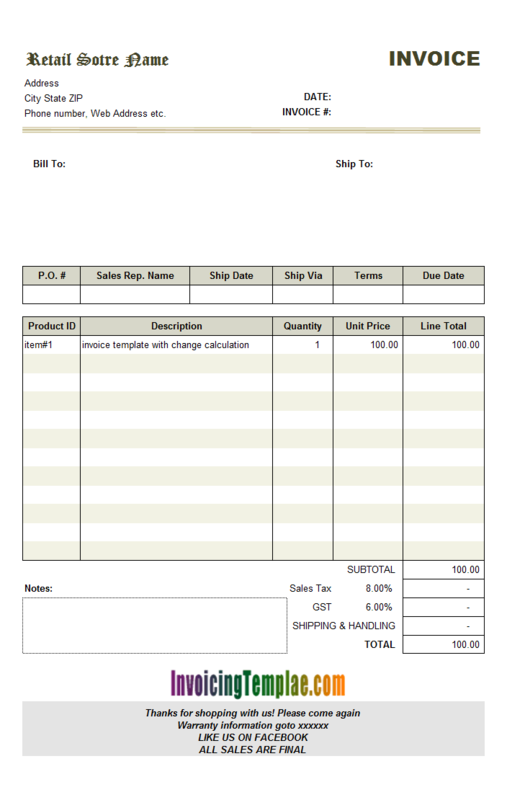 If you charge HST (Harmonized Sales Tax), visit our sample invoice template in Excel format at Canadian Invoice Template with HST. 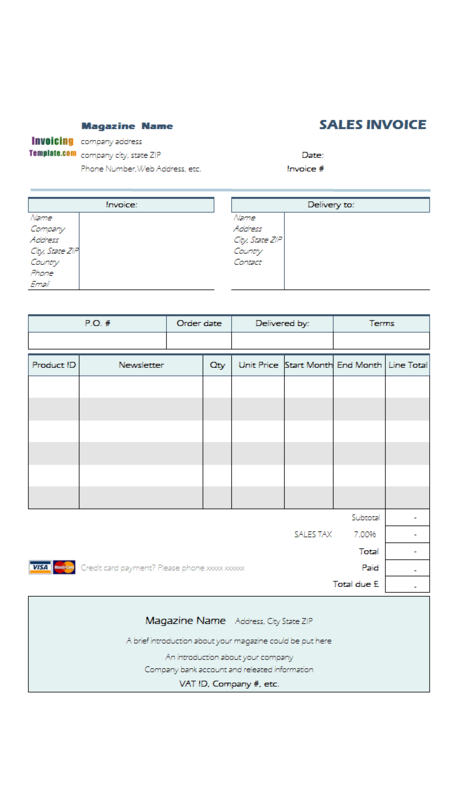 All of our templates come with a PDF sample invoice which you can download for free too. There are online GST and PST invoice template for Canada / Ontario in Microsoft Word too, which you can download for free or a small fee. However Microsoft Excel is better on doing calculations. 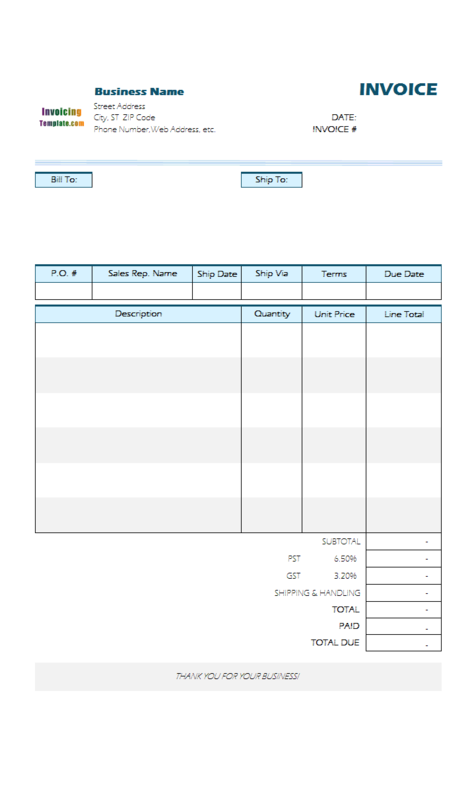 As you can see from this sample GST and PST invoice template, all you need to do is to enter the basic values, all calculable values are shown automatically when the basic values are entered. 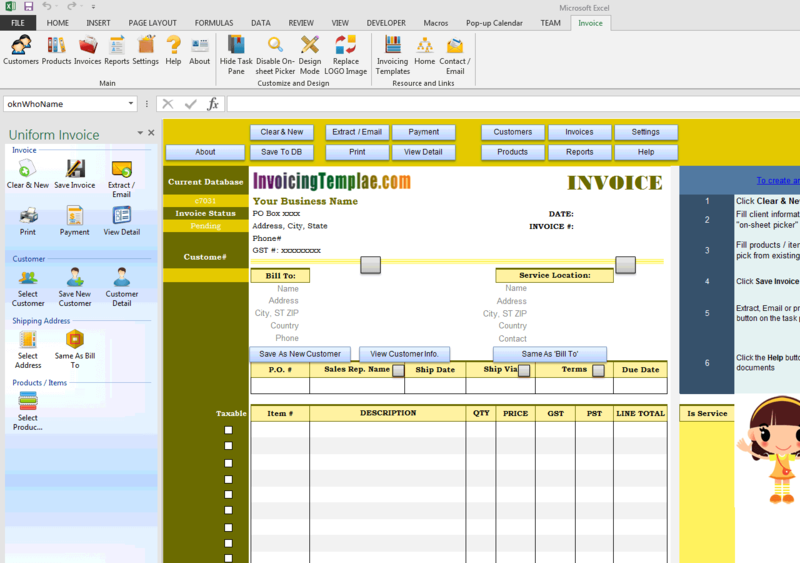 If you install Invoice Manager for Excel (namely Uniform Invoice Software), this template can be a complete and easy to use GST and PST invoicing software. 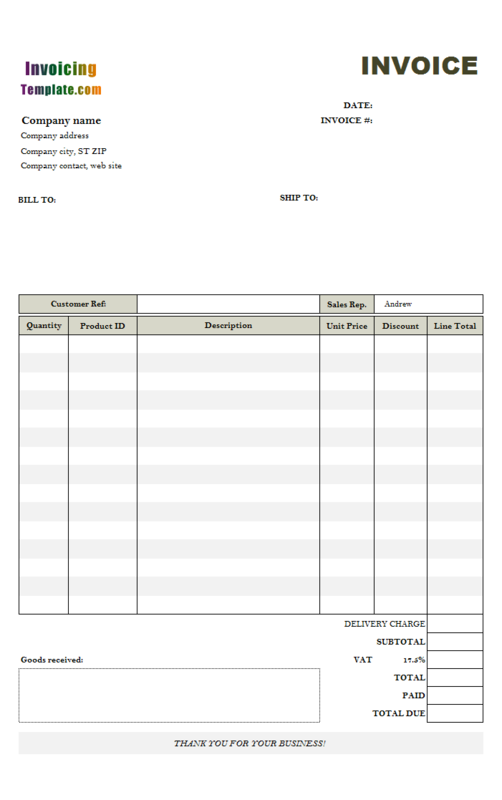 The following description was originally published on office-kit.com for C7-006 "Tax Invoice Template That Charges One Tax (GST) on Services and Two Taxes' (GST & PST) on Materials". 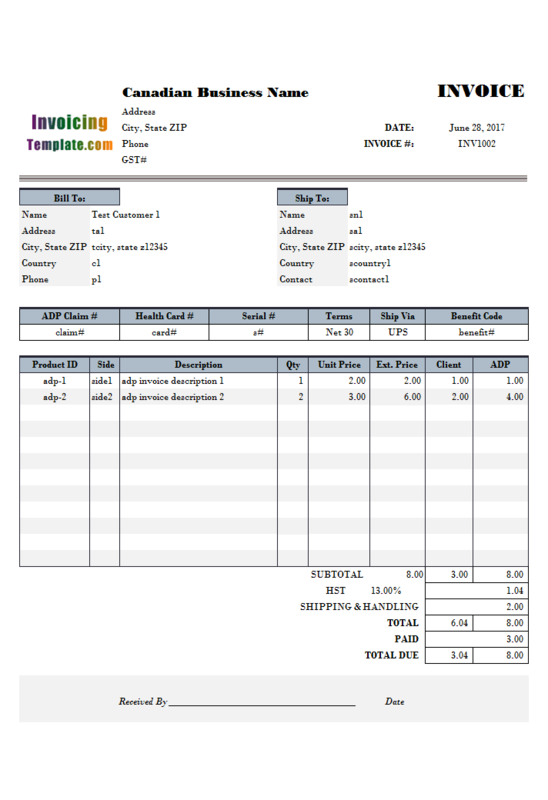 We republish it here on InvoicingTemplate.com to provide with you additional information about this template. The default template and database shipped with Invoice Manager for Excel (namely Uniform Invoice Software) already have an "Is Service" field defined for products/items, which can be set by checking the "Is Service" box on the Product Edit window. 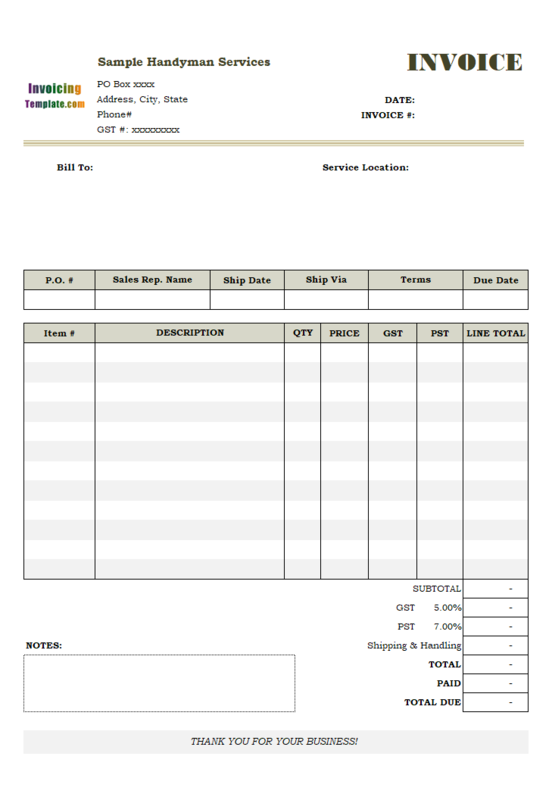 If we load this "Is Service" on to the invoice form along with the other product/item data, it is then simple to use Excel formulas to choose and calculate GST/PST taxes based on the "Is Service" value - If the current product/item is a service, we calculate only GST; if the current product/item is not a service, we calculate both GST and PST. In order to display GST, PST on the invoice detail section, we need to add two custom fields to the "InvBdy" database table. To make sure we can restore a saved invoice completely after it is saved, we also need to add the "Is Service" field to the "InvBdy" database table. The following table shows all the custom fields added to implement the GST / PST template as required. Unlike Excel Invoice Manager, which uses a separate program "Database Sesigner" to create and modify custom fields; Invoice Manager for Excel (namely Uniform Invoice Software) has a "Custom Field Manager" built in. Visit Simple Sample - Discount Amount Field for a detailed tutorial on using custom fields. To load the "Is Service" value into the invoice form when a product/item is selected, all you need to do is to name a column of cells on the invoice form, in the format oknIsService_1, oknIsService_2, ..., oknIsService_12, where "okn" is the prefix for all the cell/range names used by Invoice Manager for Excel (namely Uniform Invoice Software); and "IsService" is the field name in both the Product and InvBdy database tables - it is this name created the link between the invoice form and backend database, i.e. Invoice Manager for Excel (namely Uniform Invoice Software) depends on this field name to find out where to display a value loaded from database; and the last part, "_1", "_2", ..., "_12", is the line number. 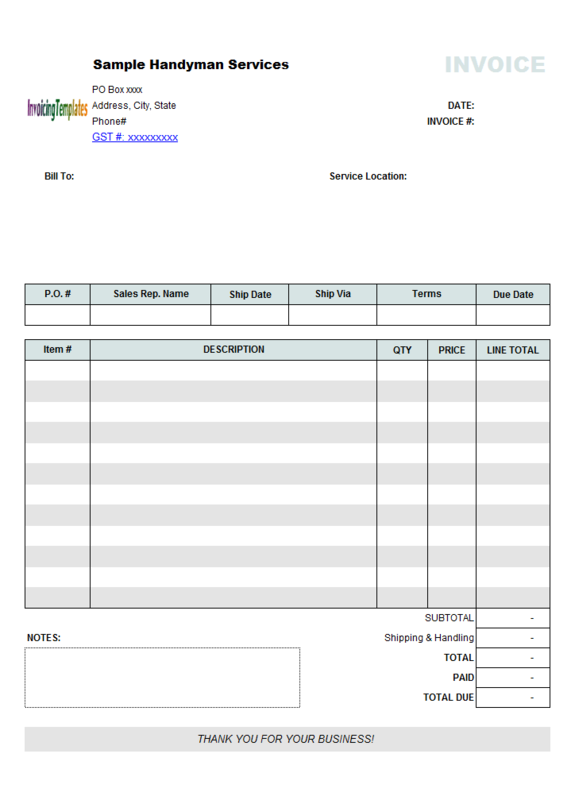 The following are the brief steps to implement the Is Service column on the invoice sheet. Switch to design mode by pressing the "Design Mode" button on the ribbon tab. 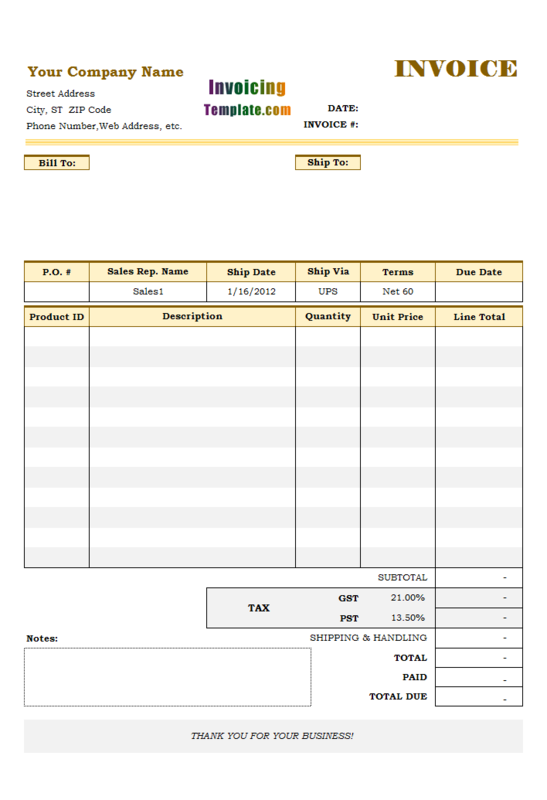 Drag your mouse to select a column of cells at the right side of the invoice body and out of the print area. Right-click one of the selected cells, choose Format Cells. 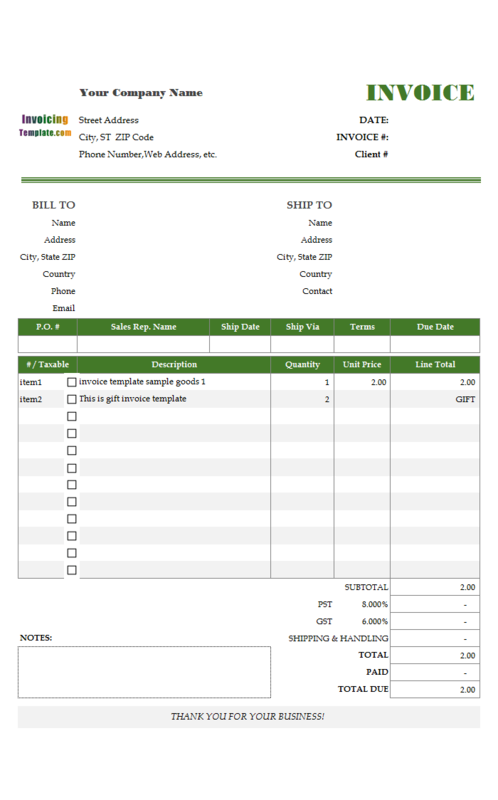 On the Patterns tab, set a background color for the cells; on the Protection tab, clear the Locked box - If you don't clear the Locked box, Invoice Manager for Excel (namely Uniform Invoice Software) will not write data to the cells once the invoice template is protected, as detailed at Locking/Unlocking Cells. Name the cells oknIsService_1, oknIsService_2... oknIsService_12. 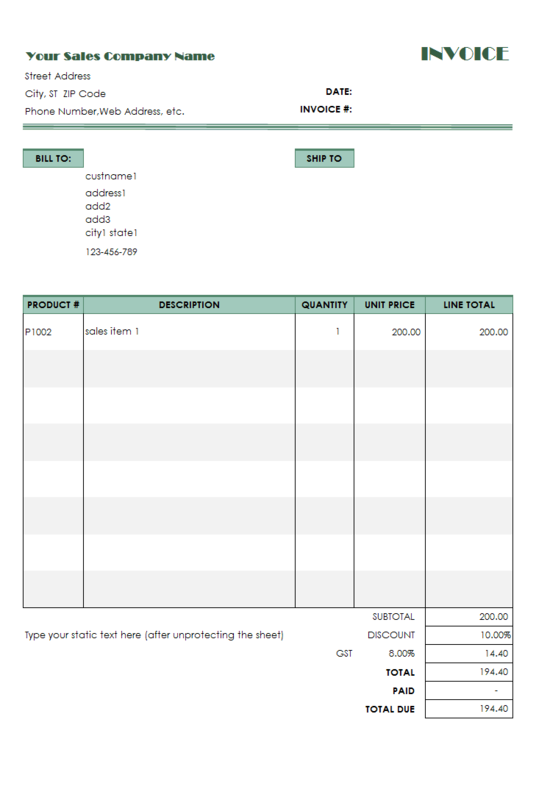 This tax invoice template also has GST and PST tax columns on the invoice body, so that the tax charged on each product/item line is clearly listed. 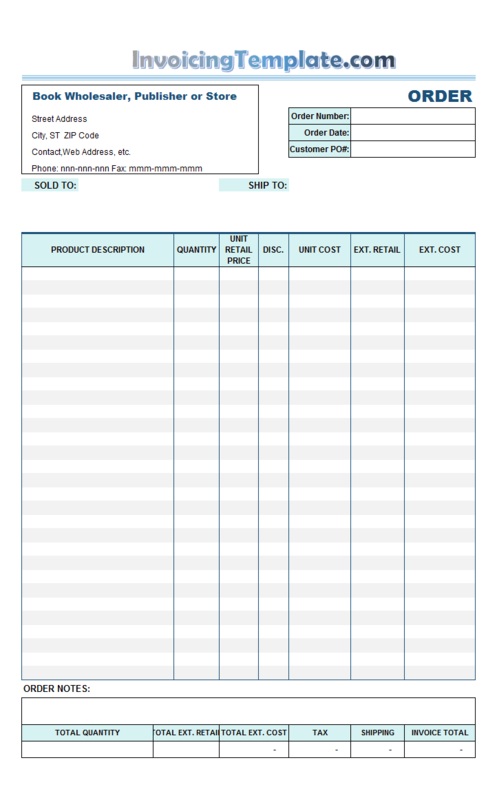 To implement this, you need to add two columns to the invoice body section. 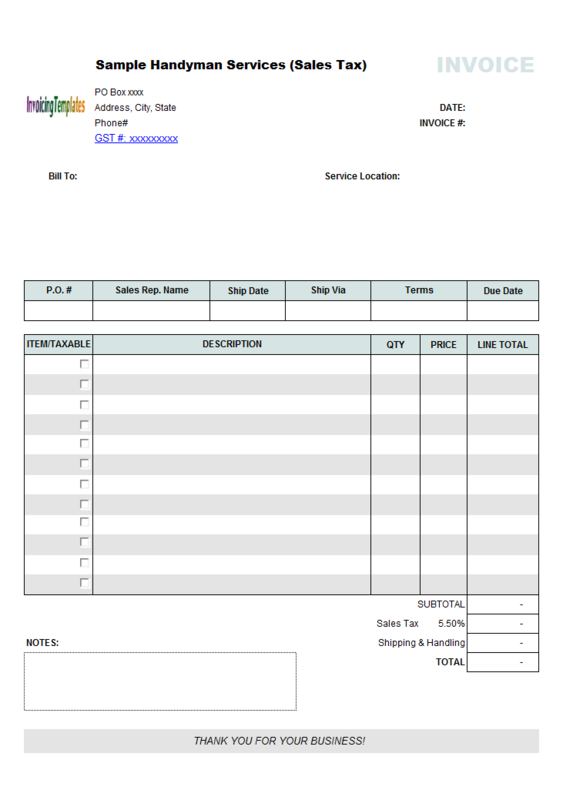 Add two columns to the invoice body. In this implementation, the GST and PST tax columns are added to the left of the Line total column. Name the cells. The first column will store GST tax, so the cells are named oknGST_1, oknGST_2...oknGST_12; the second column will store PST tax, so the cells are named oknPST_1, oknPST_2...oknPST_12. 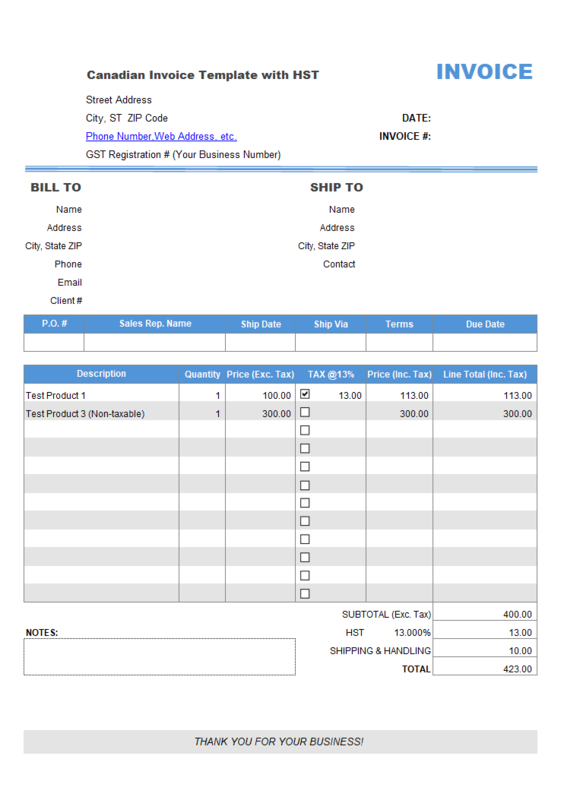 Fine tune the invoice form, such as settings colors, adjusting the sizes of cells, etc., to make the newly added column looks natural to the other part of the invoice form. In above formulas, "_?" is the line number of the current item/product. 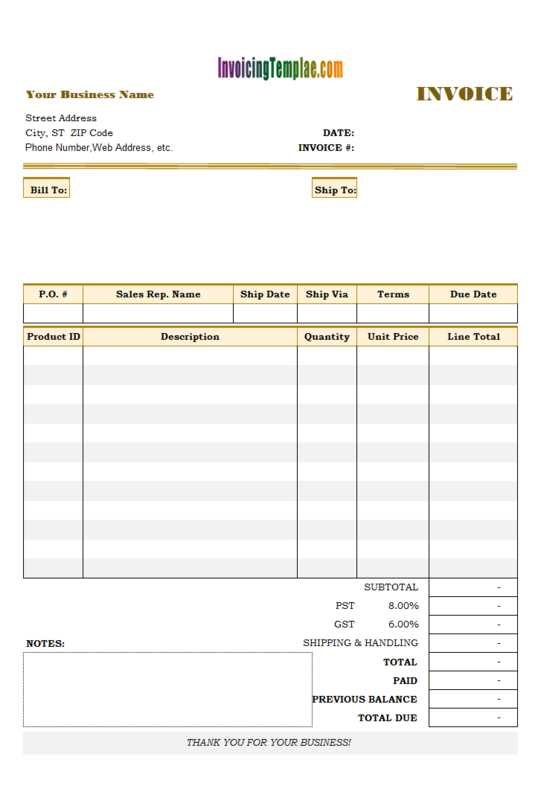 Like other form designs here on InvoicingTemplate.com, GST and PST Billing Form is free (offered to you at a price of 0.00USD). It works on Windows XP and all newer versions of Windows, and Excel 2007, 2010, 2013 or 2016.